Bibbulmun Track: Sea level to 1,920 ft (585 m). Within this region I backpack along old forestry roads, sandy tracks, and purpose built walking tracks. The south-west of Western Australia allows for hiking and backpacking from coastal plains to forested ranges. I hike in varying conditions from forestry tracks, to sandy tracks to single purpose walking trails, from rock hopping, to beach walking to completely off-track through open and dense bush country. During the expected test period I will be going on twelve overnight trips and trips ranging from one to two days of backpacking. I will be camping out between eight nights and 20 days between September 2007 and January 2008. Each over night hike of two nights duration would involve approximately 21 mi (35 km) and the day trips would be 7 to 9 mi (12 to 15 km). It is now well into our summer but we are still experiencing some unseasonably cool nights and mornings with a low of 50 F (10 C) and a high of 88 F (31 C) in another few months it will be winter and the cold will set in. Daytime temperatures will range during the testing period, from a minimum of 57 F (14 C) to 79 F (26 C) during April, to 46 F (8 C) to 64 F (18 C) in July 2008. The average rainfall for this time of year is, 1 3/4 in (44 mm) in April to 6 in (175 mm) in July. The Hydroseal DryComp AirX Sack (drycomp sack) is a dry sack and compression sack all in one. As well as being water proof this sack uses a band of air permeable fabric that allows the air to pass through the band to allow compression yet keep the contents dry. Combine this with fully taped seams to keep water out and a roll top lid this sack seems to have it all, but fabric it? I will attempt with my testing to find out just how good this sack is. The sack that I am testing arrived in a cardboard box packed for shipping and inside was the sack. It comes with an outer tag/wrapper that contains instructions for use and dimensions and so on. I quickly removed the tag and started to look closer at the sack, I don't always read instructions and found it was not really needed in this case. The sack comes packed in its own bag made of the same water proof material, with a little tag to hang it by when not in use. The first thing I found strange about the sack that it is packed inside out in its bag. It took a moment to realise this and turn it right side out before I could use it. The zippered bag doubles as small item storage bag when the sack is in use, as when you turn the bag right side out the little bag is now on the inside and is capable of storing keys and other small things. I was heading out of town for an overnight camping trip when the sack arrived so I was able to put it to use straight away. This photo show the sack packed with an assortment of clothing that I took for evening wear as it would be cold at night. It is very easy to use and just a matter of pushing clothes down through the opening and then rolling the lid down and clipping the buckles closed. I rolled the lid down three times before closing the buckles and then found the instructions say to roll three times as well. The external roll-top waterproof closure is an easy to use system that should be water proof. In this photo you can see the lid rolled down and two of the four compression straps pulled down quite tight. The main body is made from Hydroseal® coated Antron nylon and should be waterproof and durable. The air permeable/waterproof fabric band purges air during compression and looks similar to rip stop nylon or Sil-Nylon. In this photo it looks like the bottom of the sack just sits in the section used for compression, but it is all sewn in place and very strong. Here you can see the webbing that is across the bottom of the sack and is used as a handle to assist in removing items from within the sack, The feature I like very much and makes things a lot easier. Not shown is the length of webbing that runs down the side if the sack that is used as a daisy chain. Please bookmark this page and check back in about two months for my field report where I will really put the sack through its paces. In particular I will be testing the following areas. 1. The OR web site claims "protection and durability" with the sacks so I will be testing how well my items fit and how compressed I can get them. I will then attach the sacks to the out side of my pack and hike off track to test for durability. 2. The sacks feature an air permeable/waterproof fabric which means I should be able to squeeze out the last bit of air and then with the sack on the out of my pack my gear inside should stay dry. 3. The sack have Waterproof taped seams, so I will be testing how well the seams seal, how well the tape stays attached to the seam. Will rolling and unrolling cause the tape to separate from the seam? 4. The External roll-top waterproof closure, how well fabric this seal? Does it need to be rolled down a long way to create the seal? Will the Antron nylon used in manufacture cope well with months of rolling up and down? 5. The web site states that durable buckle secures the roll top. Are they strong? Will they take lots of clipping together? I also wonder if our strong sun here in summer would affect the plastic in the buckles. 6. The sacks have internal zippered pockets, what are the zips made from? Plastic or steel? Will they work even when damp? Are they placed in such a position that they could be damaged by rolling the sack right down? 7. 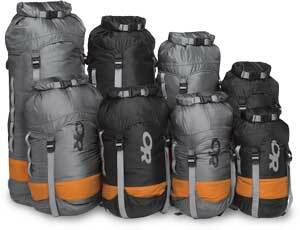 The sacks have four compression straps on the sides, are they easy to use? Could I quickly pack up my gear inside with cold wet fingers? 8. The external daisy chain looks like it would be suitable for attaching the sack to my pack, but are they placed on the sack so as I can still attach it when the sacks are rolled right down? 9. The webbing bottom handle may be handy but will the rolled top stay shut when upside down and the weight in the sack now resting on the lid? I have been using the compression sack now for about two months and frankly, I love it. The first night I had it I just had to see how water proof this sack is, so I filled it with clothing that I would take with me while camping. Clothing to change into once in camp that would keep me warm and hopefully be dry to put on. I also placed a few sheets of facial paper tissue into the small pocket on the inside. The clothes I packed can be seen HERE. I then compressed the sack down as tight as I could and tossed it outside onto the back lawn where I left it in the rain for two days and one night. On the second night I brought it inside to check on the condition of my clothes. Some water had worked its way down into the folds of the closure but only about three turns of the lid, it had not reached any where near the clothes and to my surprise every piece of clothing was bone dry. Not even the paper tissue had become wet or even damp. I was very happy with this part of my testing. Here the quality of the sewing can be seen and the extra bar tack stitching to ensure that the buckles do not pull away from the material. The buckles hold very well and never slip and come undone. I have used this sack now on about five over night trips and I also used the sack as a bag to carry a jacket and all the things I would normally take to work with me for about two weeks. I wanted to see how the sack would hold up to every day use and to check for any wear. I have carried the sack by the daisy chain, shown better in the picture above and by the strap shown better on the left of THIS picture. There are no signs of wear at all at any of the areas where these straps are attached to the strap. The sack is starting to get a nice worn in look about it and the material is starting to soften up nicely. I will be carrying another test of how water proof the sack is now that the sack is a little older and may put it out on the lawn with the sprinklers going. The buckle at the top of the sack shows no sign of weakening and still clips together well as I would expect. The side seams show no sign of stretching where the sack has been compressed down with clothes in it. I now use this sack as a way of storing the clothes I take camping with me while at home. When I return from a trip my clothes go to be washed, and then when dry they go back into the sack compressed just a little and put away with my other gear. The zip on the inside pocket is a metal zipper but shows no signs of rust or wear and still runs very smoothly. I use this pocket to store small items such as keys, identification, credit card and that sort of things. I have found that when I roll down the lid and just before tightening the straps that the buckle and the roll will either sit flat or turn it self over and settle into place, then I can pull down on the straps to compress the contents. The orange section here is made from an air permeable/waterproof fabric that looks like a light weight nylon. The air caught by the rolling down of the lid and by the tightening of the straps is forced out of this section although this is hard to see in a test but it works very well just the same. I find I have to roll the top down slowly to allow the air time to pass through the material before tightening of the straps. My use of the sack. The contents of sack. This is the clothing that I would take on a normal weekend away over winter. All of this easily fits into the sack with room to spare. 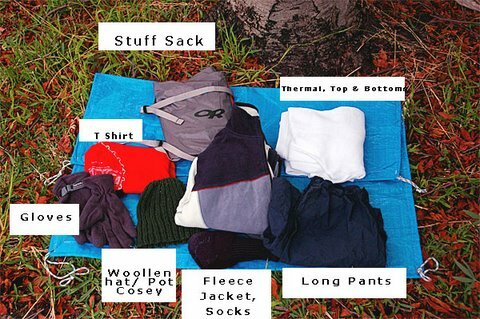 The contents are: thermal pants and top, long nylon type pants, fleecy jacket and socks, wool hat, gloves and a T shirt. When I first started to use the sack I would stuff my clothes into it and compress everything down as much as I could. This would give me a solid ball of material to pack into my back pack, which did not really fit very well. Because it was so solid I had a lot of unusable space around the sack and it was not until I started to compress the contents a lot less that I felt happy with the way it packed. What I do now is to place every thing into the sack and roll the lid down, then compress the sack enough to reduce the size of the contents and yet still leave the sack flexible enough so that other items can be packed into all the available space of my 60 L (3661 cu in) back pack. I have now been using this sack for about four months and I would have to say that I think it is very good. It has done exactly as it is supposed to do and that is to compress down my clothing and keep them dry. I wanted to test the sack in a simular way to how I tested it the first time. So I placed some clothing into the sack and some paper tissues into the inside pocket, because it is now summer and not raining I tossed the sack out onto the back lawn and turned on the sprinklers for about half an hour. I wanted to run the test again to see if a few months of rolling and compressing and general use of the sack would allow water to pass through the material. Once the sprinklers had turned off I went out and picked up the soaking wet sack and opened it. While the sack was wet on the outside not one piece of clothing or one tissue had become wet, just as I expected. Everything inside was dry just as it was with the first test. The sack itself looks very new still and shows no real signs of wear, I am very happy with the way this sack has performed and would recommend it highly. At 9.14 oz (259 g) some may consider it to be too heavy an item to carry and yes if I were the type to count every ounce (gram) then I may think the same, but if I wanted to be 100% sure that when I arrived in camp and in the rain my clothes would be dry then this is the way to do it. The pocket the sack stuffs into is a little too small, I find it hard to get the sack back inside the pocket and as such I do not pack it away as I would like. The straps are perhaps a little long, even when the sack is fully uncompressed there is quite a bit of strapping that hangs down from the buckle and then when compressed they hang a lot (That is a bit picky perhaps). All in all this is a very nice piece of equipment that will last me through many, many winter hiking seasons. Thanks very much to Outdoor Research and Back Pack Gear Test for the opportunity to test such a good quality and nice to use piece of gear.